I can’t remember how I stumbled upon Shauna’s first book, Cold Tangerines, but after my first read through I was hooked. A woman writing openly and honestly about her delights and struggles in life. I read her heart. I read her joys. I read her tears. And in doing so, I felt like her friend. Bread & Wine is a celebration of gathering around the table with our friends and family. Whether for an impromptu birthday party, non-traditional holiday celebrations, or just to share a favorite cookie with our best friend. 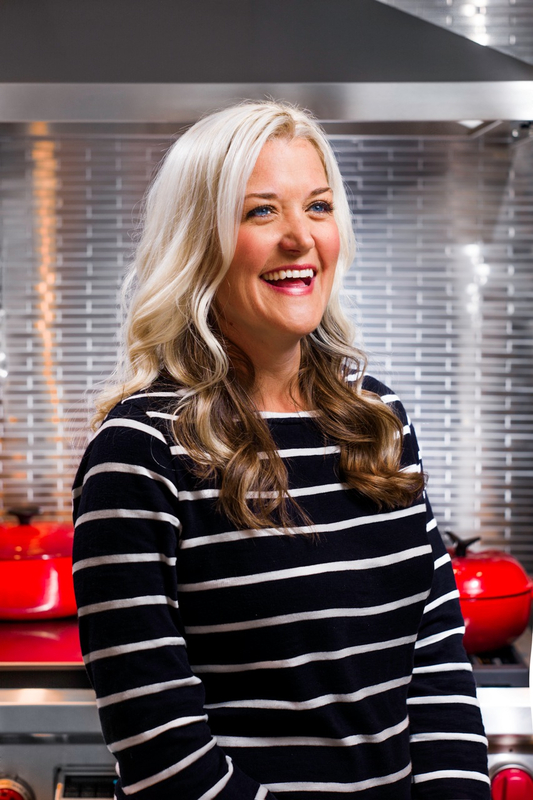 Shauna challenged me to think on why I want to have friends and family around my own table, and the atmosphere I give them to live in while in my home. 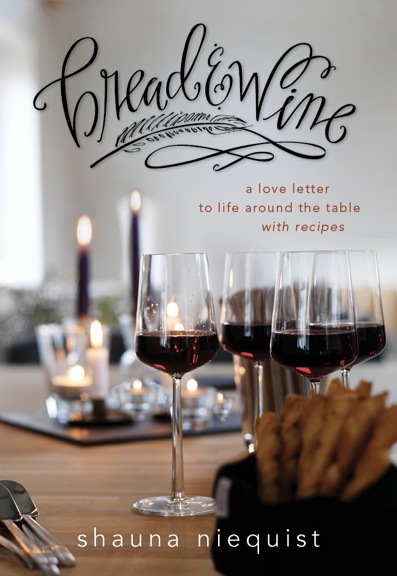 Bread & Wine will be released on April 9th, but is available for pre-order now at Amazon.com. My friend Shane says the genius of Communion, of bread and wine, is that the bread is the food of the poor and wine the drink of the privileged, and that every time we see those two together, we are reminded of what we share instead of what divides us. I believe the bead and wine is for all of us, for every person, and invitation to believe, a hand extended from divine to human. I believe it’s to be torn and handled, gulped. I believe we can practice the sacrament of Communion anywhere at all, that a forest clearing can become a church and any one of us a prestige as we bless the bread and the wine. Holiness abounds, should we choose to look for it. The whisper and drumbeat of God’s Spirit are all around us, should we choose to listen for them. The building blocks of the most common meal – the bread and the wine – are reminders to us: “He’s here! God is here, and He’s good.” Every time we eat, every time we gather, every time the table is filled: He’s here. He’s here and He is good. Ingredients and instructions by Jim Lahey, owner of Sullivan Street Bakery. 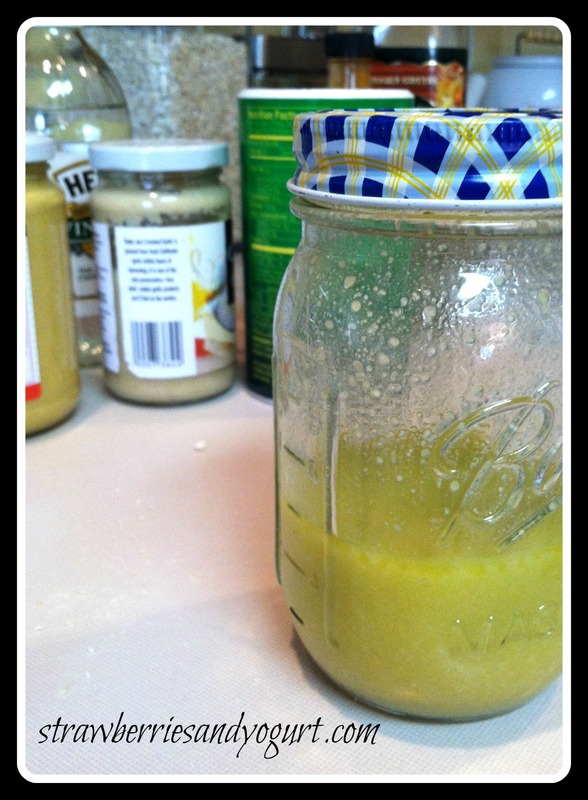 I’ve been hearing about this recipe for years, but my fear of yeast has kept me away. And then all at once, on a cool fall day, I plunged in, and I have to tell you, this is incredible bread, and incredibly easy. 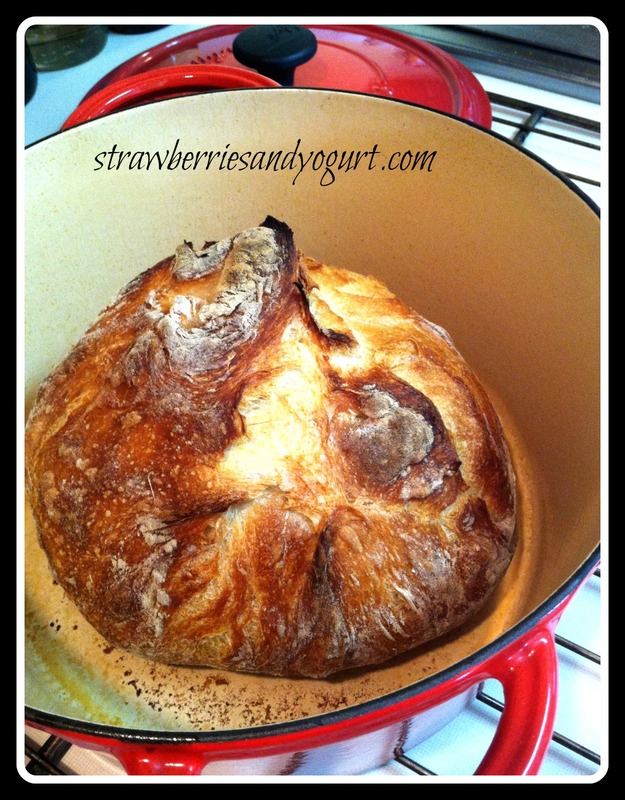 A few notes, I used my beloved, batter, scratched Le Creuset dutch oven, and it works perfectly. Also, every time I make it, I hope that this time it’s going to rise into a huge, puffy impressive sphere, and really, it never does. Mine never doubles the way the recipe says it will. this is nerve-racking every time, and then the bread is delicious every time. Like life, right? We freak out, generally for nothing. That’s how this bread is. It makes me nervous and makes me certain I’ve failed, and then it delights me with that crusty, crackling, gorgeous loaf. Bread baking is an emotional roller coaster. Hold on tight. Also, I use cornmeal to dust it because I like the gritty yellowness, and I’m pretty generous with it, especially on the tea towel so it doesn’t get all sticky. A few more things: the recipe instructs you to let the dough rest for 12 hours – feel free to leave it longer than that, but not shorter. At our house, I bake it at 450 degrees for 45 minutes, and that’s perfect. You might find that 500 works better for you, or that in your oven you need the whole hour, but my recommendation is that you start with 450 and 45 minutes. Mix all of the dry ingredients in a medium bowl. Add water and incorporate with a wooden spoon or spatula for 30 seconds to 1 minute. Lightly coat the inside of a second medium bowl with olive oil and place the dough in the bowl. Cover the bowl with plastic wrap and let the dough rest 12 hours at room temperature (approx. 65 to 72 degrees). After 12 (or more) hours, remove the dough from the bowl and fold once or twice. Let the dough rest 15 minutes in the bowl or on the work surface. Next, shape the dough into a ball. Generously coat a cotton towel with flour, wheat bran or cornmeal; place the dough seamside down on the towel and dust with flour. Cover the dough with a cotton towel and let rise 1 to 2 hours at room temperature until more than doubled in size. Preheat oven 450 to 500 degrees. Place the pot in the oven at least 30 minutes prior to baking to preheat. Once the dough has more than doubled in volume, remove the pot from the oven and place the dough in the pot seamside up. Cover with the lid and bake 30 minutes. Then remove the lid and bake 15 to 30 minutes uncovered, until the loaf is nicely browned. So my first thought at reading this recipe was – I have to let this stuff sit for 12 HOURS?!? How’s that gonna work? But I mixed up the dough, went to bed and baked it the next day. I slathered a piece with butter – heaven. 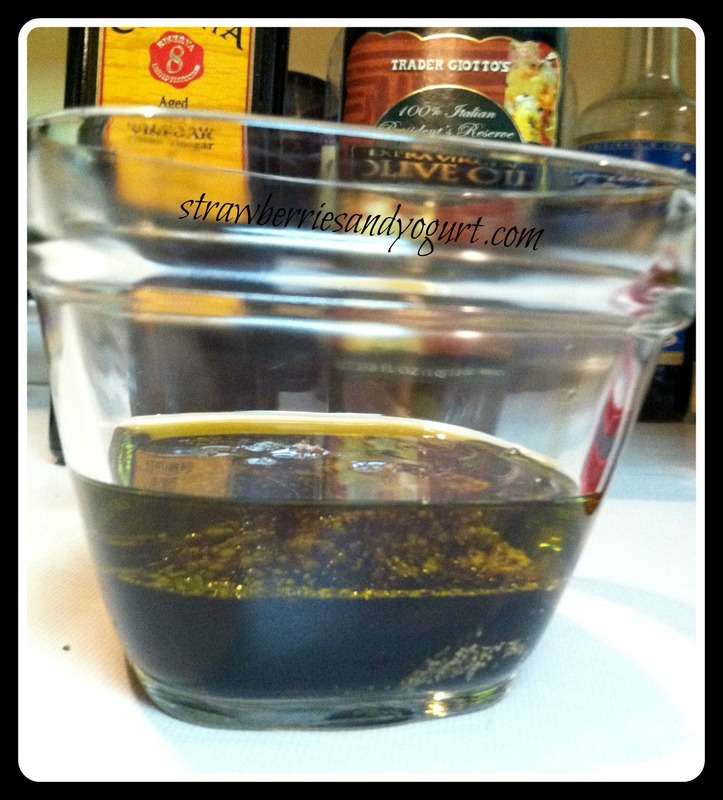 Then I dipped another piece in some olive oil and balsamic – heaven. This bread is good, and totally worth the scheduling needed to make it. 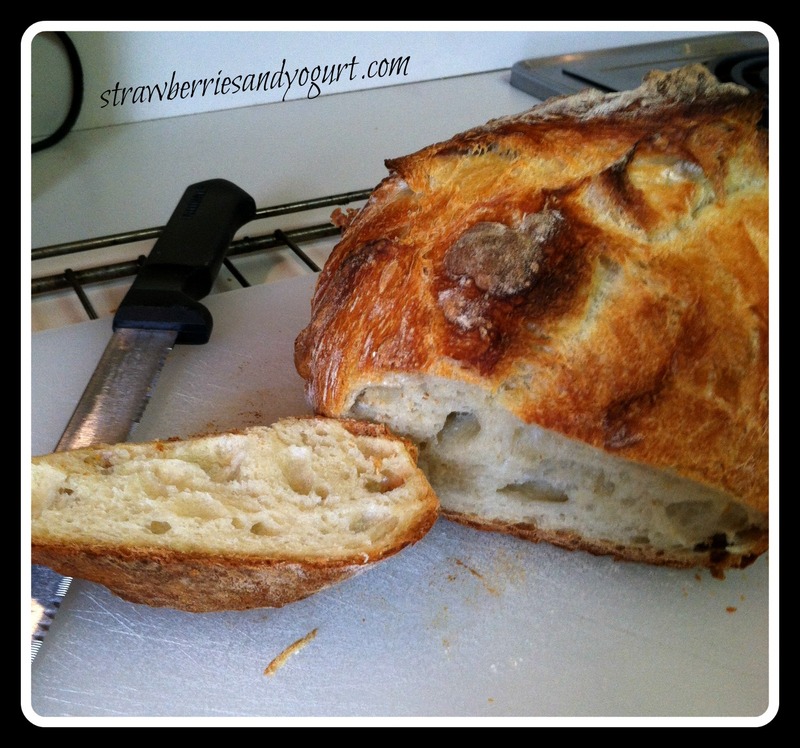 I hope you all have enjoyed this week of highlighting a few of the recipes from Shauna’s new book, Bread & Wine. Please pick up this book and let me know if you enjoy it. Shauna Niequist is the author of Cold Tangerines and Bittersweet, and Bread & Wine. Shauna grew up in Barrington, Illinois, and then studied English and French Literature at Westmont College in Santa Barbara. She is married to Aaron, who is a pianist and songwriter. Aaron is a worship leader at Willow Creek and is recording a project called A New Liturgy. Aaron & Shauna live outside Chicago with their sons, Henry and Mac. Shauna writes about the beautiful and broken moments of everyday life–friendship, family, faith, food, marriage, love, babies, books, celebration, heartache, and all the other things that shape us, delight us, and reveal to us the heart of God. This recipe was inspired by Nancy Silverton’s Tuscan White Bean Soup with prosciutto and Parmesan in her cookbook, A Twist of the Wrist. 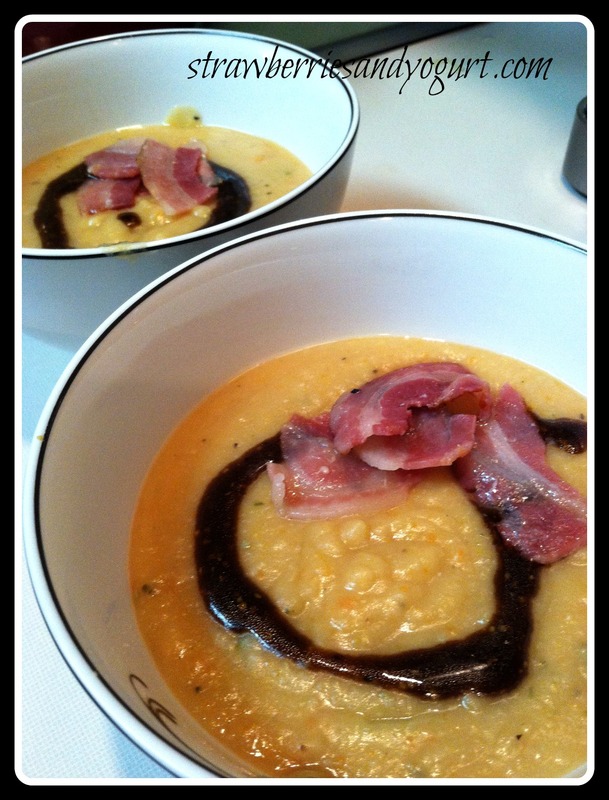 I liked the idea of a thick bean soup with ribbons of prosciutto (for the meat eaters), a dusting of Parmesan (for the dairy eaters), and a drizzle of balsamic vinaigrette. Even though Nancy’s recipe calls for just olive oil, I’m in a serious balsamic phase, and I want it on everything – Bread and Wine. In a stockpot or dutch oven, soften two sliced shallots in olive oil over medium heat. Add carrots, fennel and celery, allow to soften, 10 to 15 minutes. 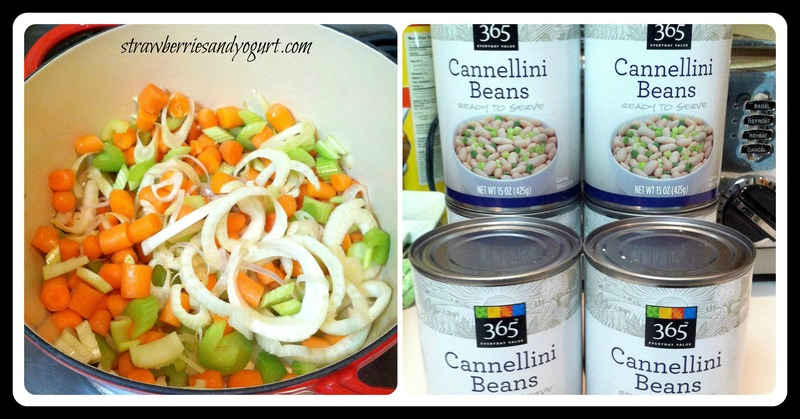 Add beans in their liquid, cover and cook for 20 minutes at a gentle boil. Taste, add salt and pepper, taste again – keep in mind that you’ll get a good amount of salt from the toppings. Cook for an additional 20 minutes, or longer if you have time. Off heat, mash with a potato masher or the back of a wooden spoon for a rustic, chunky texture. If you’d like a smoother texture, run it through a food processor or use an immersion blender in the pot. Mix a spoonful of Dijon, a few tablespoons of balsamic, a quarter cup or so of olive oil, some salt and pepper in a glass jar, then shake well. Adjust to taste – I usually like a 2:1 ratio of oil to vinegar and Dijon. Serve with a small pitcher of vinaigrette, and bowls of prosciutto torn into ribbons, curls of Parmesan and shopped rosemary. This soup is amazing. Dense, rich and flavorful. And I’m glad to have a “go to” recipe on hand for my friends and family who have dietary restrictions. Chop garlic clove in a food processor, then add remaining ingredients and blend together. Or chop a garlic clove, drop it into the bottom of an old pickle jar or jelly jar, add everything else, and shake like crazy. Preheat the oven to 400 degrees, and then toss the frozen bread cubes with olive oil, salt, pepper and grated Parm. Bake until crispy and golden, about 8 to 10 minutes. Toss the romaine lettuce with croutons, grated Parm and dressing. Husband is a BIG fan of a caesar salad, so this was a no brainer to try. 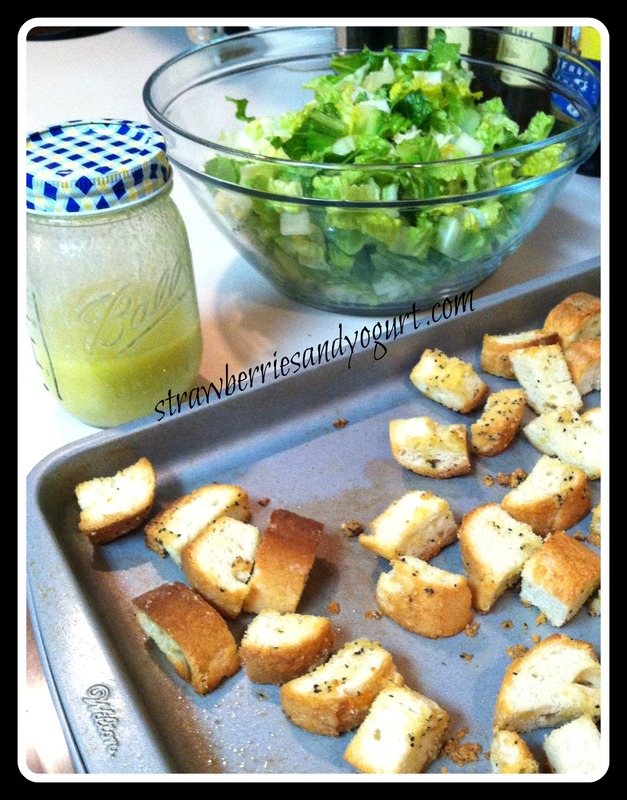 I loved the ease of throwing together my own croutons and the light spicy taste of the dressing was perfect.